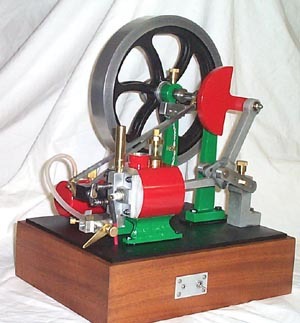 Congratulations to Ken Stuempges who just completed building the Atkinson Cycle engine. He sent me these photos of his great looking engine and he writes the following. . . I had the opportunity of seeing Dave Smith's engine at a small show in Shell Knob MO. last June. He and another gentleman were there with their Atkinson's. I bought the book, made the patterns and castings, and just completed the engine. I made a few changes (doesn't everyone?) but they are minor. It runs great, but the carb is a little "touchy", and I want to balance the flywheel yet. . . . I made the water jacket out of a piece of 3" round Aluminum bar stock, milled flat topand bottom, and hollowed out to provide a space around the cylinder, then press-fittedthe cylinder in. The base for it is a small "lost foam" casting. I used lost foam because of the complexity of the shape. I also used a little lost foam casting for the rocker armbracket. I also made the oiler. The finish I used is Powder-Coat. 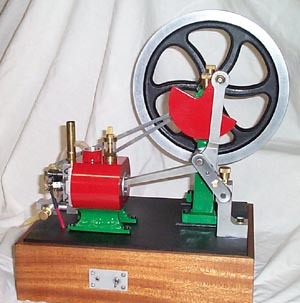 This is my first ICengine, after 4 stirling and 4 steam types.